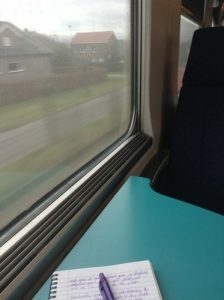 Drama in the Netherlands is a train running 15 minutes late. Phones are pulled out and hasty calls made. Harried people search for a seat where they can send urgent emails. Everyone from the elderly to school children stomps around angrily. 15 minutes later, everyone is on the train and settled into the trip and the delay is forgotten. The train glides past green, green fields. I zone out and wait to arrive. 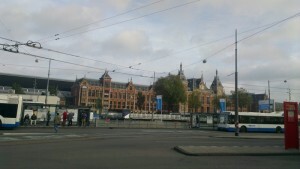 At Amsterdam Station, I pass a group of teenage boys. Dutch teenagers sound just like Afrikaans teenagers. I’m smiling by the time I reach the exit. I follow the crowds to the main road… and get lost. I have the name of the street I’m supposed to be on and I have a map, but I can’t seem to find the place. The streets are a maze of crowds, neon lights, tourist attractions, noisy trams and stoned people. Everything smells like marijuana and lentil curries. I’m still carrying my backpack and people keep bumping into me. The street signs don’t seem to help. Eventually, I go back to the station and start again. This time I’m more successful. I’m quite relieved by the time I reach my backpackers. Durty Nellie’s Irish Pub and Hostel. I’ve stayed in such different hostels in the Netherlands. ROOM Rotterdam, efficient, clean and convenient, Flying Pig in Noordwijk much more of a party hostel, now Durty Nellie’s. I think this one is my favourite. Downstairs is a traditional Irish Pub – or at least what a traditional Irish Pub looks in non-Irish cities (one day I hope to be able to compare it to the real thing). Upstairs, with really solid security, are several en-suite dorm rooms. Durty Nellie’s isn’t a coffee shop (no smoking, no drugs), so it’s a welcome break from the chaos outside. I had planned to spend the afternoon quietly, perhaps quietly in the corner of the pub with a pint, but after looking through some of the brochures I’d been given and the Amsterdam city guidebook I’d picked up at the last minute in Johannesburg, I felt the urge to explore. Armed with a map, I set off for Dam Square. It turned out to be quite easy to find. I guess my earlier wanderings had given me a fair idea of the layout of central Amsterdam. In the square is a fun-fair. I’m tempted by the Ferris wheel (but definitely not at all by some of the other crazy rides) but decide to leave it for the moment. Beyond Madame Tussauds, I spot the Royal Palace. It is impressive looking and I take a moment to take it in before walking past to the Nieuwe Kerk. 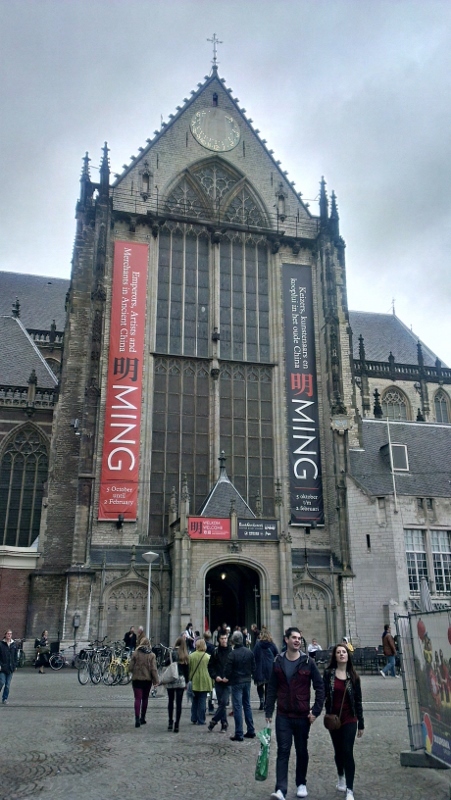 The church isn’t used anymore and inside is a massive Ming Dynasty exhibition. 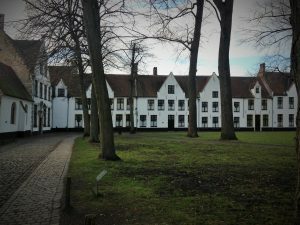 With limited time in Amsterdam, and not much interest in Chinese history, I wander out again. 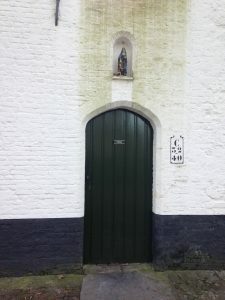 I am intrigued by the fascinating clock on the Nieuwe Kerk clock tower – a clock with the numbers in a closed U-shape around hands fixed to a point at the top, instead of around the hands attached the centre of the circle. I stop for a moment. I’ve been moving around so much in the last few days and rushing so much before that, that it’s almost easy to forget to stop and take in the fact that I am here, that I am standing in the centre of a major capital city in Europe. I head off down the road to see what I can see. It is a terrible stereotype to say that Namibia is a desert. Namibia is a huge country (almost twice the size of Kenya according to my guide-book), with something like 29 different climatic/environmental zones. Two of these are desert – Namib and Khalahari – but even these are not anything like uniform. I knew all this long before I took off from OR Tambo on the last Thursday in November. And yet, I found myself, as we came in to land in Windhoek, surprised that the veld below me looked green and pleasant and rather like the Northern Cape. Stereotypes are hard to break.